Our 1×19 galvanized steel wire rope is coated with a thin layer of zinc that protects the material from corrosion and prevents rust. It is most typically used in marine, automotive and architectural applications where there is a risk of the rope corroding. Why buy the 1×19 galvanized steel wire rope? The 1×19 galvanized steel wire rope is made up of 19 strands of rope surrounding 1 central strand core and is available in a wide range of diameters. It has a high breaking strength and is extremely resistant. Our 1×19 construction rope is suitable for multi-layer spooling and often used for yacht rigging or balustrade. This is because whilst it is less flexible than a lot of other ropes due to the added weight of galvanized steel and its construction, it is also extremely strong. When using 1×19 construction cable in salt water environments, it is recommended that you use a class A standard rope to avoid excessive corrosion. 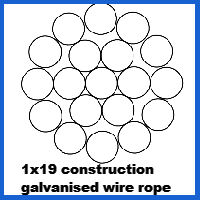 Our 1×19 construction rope is available in a wide range of diameters depending on your requirements. All of our cable is of premium quality and manufactured from the highest grade marine quality steel, providing a high-quality rope with an excellent breaking load and low stretch characteristics. For further information on this product or for additional advice, please contact us through Rope Services Direct, or alternatively give us a call on 01384 78004. 1x19 Galvanized Steel Wire Rope Overall rating: 5 out of 5 based on 6 reviews.